Wouldn’t it be convenient if you could just mention the timing of a particular event in its title on a digital calendar, and it automatically recognizes the time and saves it without asking the users to do so? Well, it would surely prove to be convenient. 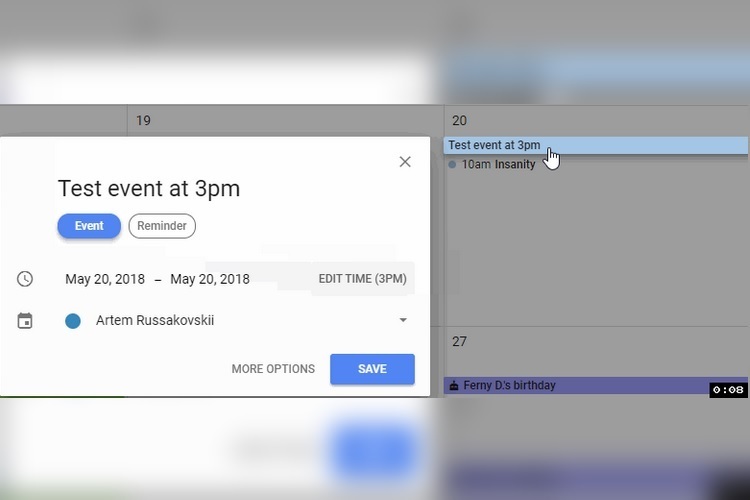 The good news is, Google seems to have heard the wish of users, and has responded by adding the feature to the Google Calendar, in a new update that’s already rolling out. The handy new feature was first spotted by the folks over at Android Police, and as mentioned above, the nifty functionality works just fine. Based on the feedback you submitted, we’ve been hard at work to bring the convenience of creating events simply by typing the title and time to the new Calendar on the web. Google announced the availability of the new feature via a post on the official Google Calendar Help Forum, where users had requested for the functionality to be made available in Google Calendar. To quickly create an event, click the space next to the date you want to add an event to, and type your event’s title and time. Calendar will automatically create the event at the right time for you. TIP: You can also press Shift + C to quickly add an event from anywhere in Calendar! I personally tested the feature with the Google Calendar linked to my Google account, and it worked perfectly well. However, there is one slight problem with Google Calendar’s new feature. You have to add either AM/PM with the numerical value in the event’s title to specify the exact time, or else, it will save an AM or PM value of its own. So, unless you want to be reminded of a dinner date at 8:00 AM in the morning, do remember to use the right suffix.